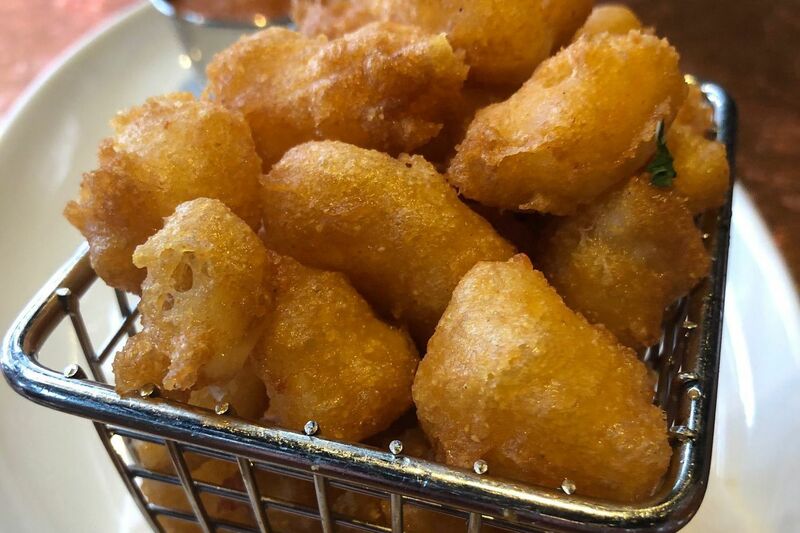 Cheese curds are discounted to $4 during happy hour at City Works in King of Prussia Town Center. Did someone say 90 beers on tap, a quarter of which are locals? That seems to be the big draw at this Chicago-based pourhouse, whose wide-open, high-ceilinged atmospherics, wall of TVs, and roll-up doors give it an air of constant busyness. Happy hour deals are a good bet, especially when the big doors are up. The price of four appetizers (pretzel bites, firecracker rolls, Nashville hot and Southern fried popcorn chicken, and perfectly greasy cheese curds served with a smoky tomato coulis) gets cut in half to $4. Certain wines are half-price and a few beers are discounted to $4, which is in itself not a big deal because City Works’ regular price for many 6-ounce sample pours is $3. At a place like this, you’d likely want to try at least a couple.